Individual firms, partnerships, or corporations engaged in the manufacturing and marketing of vinyl and/or polymeric siding. Click here for a membership application. Suppliers of raw materials, equipment and services related to vinyl and polymeric siding products. Click here for a membership application. Manufacturers of predominantly polymeric accessories used as part of the installation package for vinyl or other predominantly polymeric siding products. Click here for a membership application. Your membership application and letter will be reviewed by the VSI, Inc. Board of Directors. Upon membership approval by the VSI, Inc. Board of Directors, dues must be paid before membership is active. 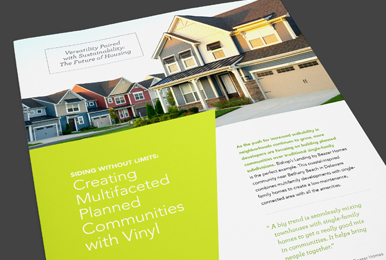 VSI, Inc. dues are based on sales of vinyl and polymeric siding or products and services to the vinyl siding industry in the year previous to budget approval. Click here for general instructions on completing the application for membership in VSI, Inc. If you have any questions regarding the membership application procedure or application form, please contact VSI President & CEO Kate Offringa at koffringa@vinylsiding.org or 202-587-5101. An informative article on the VSI Product Certification Program that independently verifies that siding products meet or exceed international standards for performance and color retention.